Jack in Sebastopol, CA – ADOPTED! | Bull Terrier Rescue, Inc.
← Howie in Sebastopol, CA – ADOPTED! Jack in Sebastopol, CA – ADOPTED! Dreamy Jack is about 3-4 years old. He was a private placement that didn’t work when he injured his new family’s cat. In that home, he was wonderful with an infant and a 3yo girl, as well as a female pit bull. He’s generally good with other dogs except around food, toys and treats. This sweet guy seems to be house trained and will need to learn more about crates and leashes. 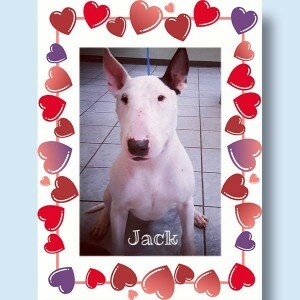 Jack will be available once he recovers from his pending neuter surgery. If your information is not yet on file, please complete our application which can be found here: http://www.bullterrierrescue.org/?page_id=572.